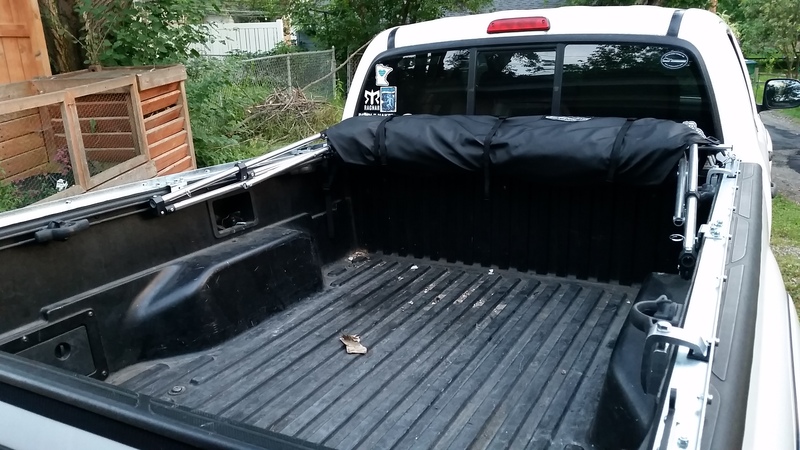 For me, everything about my truck is a compromise. Gas mileage, towing capability, size, and so on. 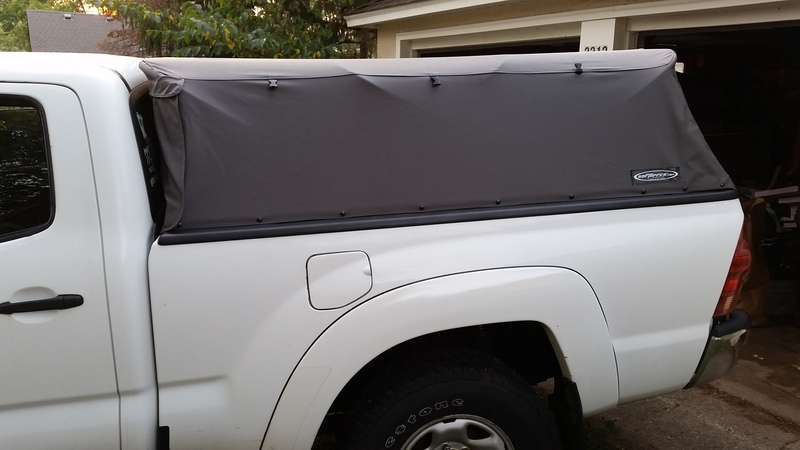 When I first got my truck, I picked a roll-up tonneau bed cover since it would allow me to keep a fair amount of stuff covered, and still roll out-of-the-way when I need to haul something larger. I even liked the low profile look of the cover. It served many uninterrupted years in the sun and snow, but after at least 7 years, it’s time has come. 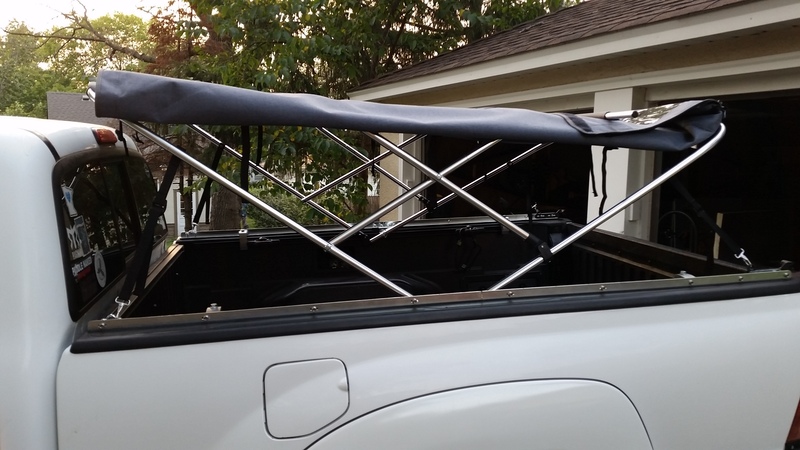 I have always wanted a full topper, but I didn’t like being stuck with a topper when I needed to carry a motorcycle or a ping-pong table (it happens!). The size and weight of a hard shell topper just cramped my style. Several years ago, I came across the Softopper on some forum or late night infomercial. I was immediately enamored. I couldn’t justify replacing my tonneau just at that moment, but I put it on the short list for the future. Now with my old cover aging out and a larger family (stuff, stuff, and more stuff) I had just the excuse that I needed. 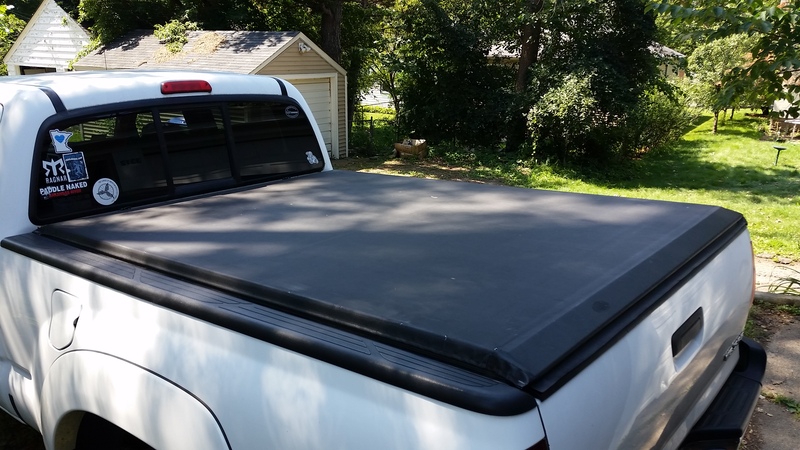 Installing the Softopper was easier than installing the tonneau. It was pretty quick and very easy. I did it in just over an hour with a lot of playing and a tasty beverage. The topper is manufactured very well. The seams were neat and the fit was perfect. I had compared (via hours of forum stalking and YouTube viewing) the Softopper to another similar solution, the Bestop Supertop. I ended up going with Softopper based on a general consensus that it has slightly better hardware and because of the solid windows (related to my primary concern). Funny that you mention that; my primary concern was the cold (extreme cold for most folks) of Minnesota winters. Vinyl has a tendency to become brittle in the cold, especially clear vinyl windows. Being that Softopper is based in Colorado, and I read a couple of accounts of folks in Montana and Alaska using them, I decided to go for it. Softopper also make a replacement solid rear panel that should handle the cold better, if needed. Being that one complaint I read in the early years was the top of the cab and the topper didn’t line up well, I was glad to see it all line up nicely after adjusting everything. All and all, think it looks pretty sharp, and I love the flexibility. I mostly keep it folded down, but have had it up for a few trips. My short-term results show a small positive impact on gas mileage, but I’ll have to watch the trend. With some practice, the topper folds up or down in just a few minutes. There’s a bit of a routine to it, much like covering or uncovering a boat, but it’s nowhere near a hassle. I picked up the optional cover to protect the top while it’s taken down. Once down, the whole unit pops out of the truck just by pulling two pins. While it might not be as completely robust as a hard shell, it is far more flexible and lighter. I plan to keep it up all winter; I’ll update on how it performs.